The game of billiards has been played for centuries in homes and establishments of all shapes and sizes. 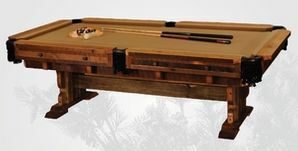 These unique billiard tables fit in perfectly with your country decor. Each one is made from quality wood and is completely functional. If you happen to be near our showroom drop by to see a catalog featuring some of our more attractive tables that are not shown online. They are crafted one at a time for our discerning customers. Spend your leisure hours relaxing over a few games or go for a no-holds barred tournament between friends and family.